Manchester’s music scene in the late 80s and throughout the 90s is truly iconic. Chart-topping successes like Oasis, the booming rave and acid house club and a slew of some of the biggest British bands of all time are products of the former industrial heartland. With only two albums under their belt and a twenty-year hiatus that began at the height of their career, the Stone Roses seemed doomed to failure. Unbelievably, despite a very short and tumultuous career, the band have stood the test of time and remain one of the most popular British alternative bands to come out of Manchester in the 90s and the sole reason some people think wearing a bucket hat is cool in 2018. In the early 80s, Altrincham Grammar School friends Ian Brown, Simon Wolstencroft, Andy Couzens and John Squire founded The Patrol, a punk band inspired by The Clash. This project, like most bands formed by schoolkids, ended about as quickly as it began after Brown sold his bass to buy a scooter. However, the guys were still friends and it didn’t take long for them to found a new band - with Brown now on vocals and the addition of bassist Pete Garner - called The Waterfront in 1983, later becoming the Stone Roses. Soon after their founding, Wolstencroft left to join fellow Manchester rockers The Fall, and long-standing drummer Reni (Alan Wren) joined the group. The group had secured their first gig by 1984, and it was a big one. Brown sent a demo tape out to an anti-heroin concert headlined by The Who’s Pete Townshend. Opening for Townshend gave The Stone Roses some much-needed exposure in a number of rock magazines, including an interview feature in the renowned Sounds Magazine. By the end of 1985, they’d had a number of management offers and eventually received an offer from the former manager of Manchester’s iconic Haçienda club Howard Jones and Factory Records producer Martin Hannett to start work on an album. In 1987, Couzens and Garner left the band due to feeling let down by Brown and Squire, now the only two founding members left. However, Garner was quickly replaced by Mani (Gary Mounfield), who Brown claims was the driving factor behind their later success. 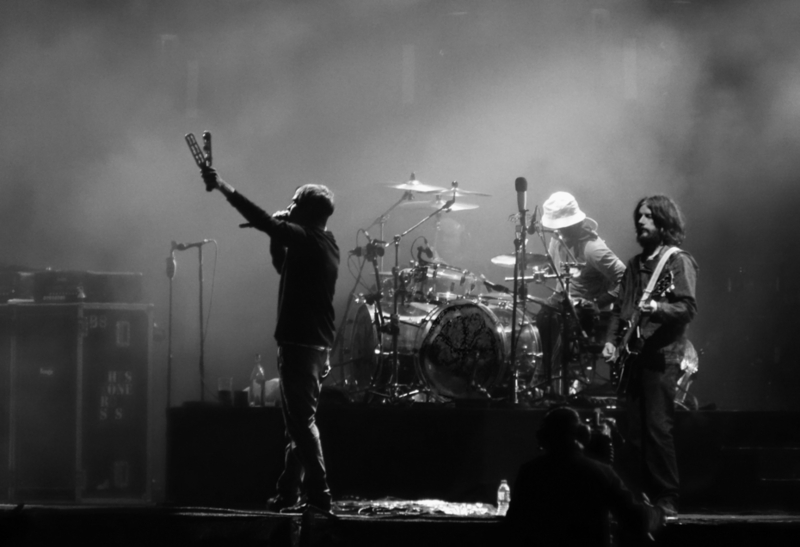 This new, reconfigured Stone Roses began gigging and touring more frequently than they ever had before, as well as becoming more prolific in their songwriting. 1987-88 saw the release of three singles. While the first two fell flat, with the third - Elephant Stone - the band had released a popular track that embraced the neo-psychedelic riffs that came to define their sound. With successful singles finally came a record deal and the band were soon signed to Silvertone Records and released their self-titled debut in May 1989 to critical acclaim. The release of the album was enough to push the band into the limelight with singles She Bangs The Drums and Fools Gold gave them their break, reaching number 32 and number 8 in the charts respectively. 1989 was a year of definitive successes for the Stone Roses. They had broken the top 10, released a critically acclaimed debut, been voted best band (and best new band), best album and best single in the NME readers poll and played a sold-out show to 7000 people at London’s Alexandra Palace. The same couldn’t be said for the following year. With the success of their first album, the band couldn’t wait to get back into the studio and record their much anticipated follow up. Brown exuded confidence - well, arrogance - demo tapes were constantly being recorded and the public was crying out for more Stone Roses. Behind the scenes, not everything was going as well as the band wanted. Unhappy with the way they were being paid by their label, Silvertone Records, a legal battle began. The contract is viewed as one of the worst in musical history: the band received no payment on the first 30,000 records sold and a number of injunctions prevented them from releasing any new material. The band were insistent that during their legal troubles they were working on the new album but, in actuality, they were far more concerned with following Man United and getting involved in the drug-fuelled hedonistic lifestyle of Manchester’s growing rave scene. In 1991, the band were finally released from their contract with Silvertone and finally began work on their next record. However, their years away found them wallowing outside of the wider consciousness of music fans. It took 347 ten-hour days to bring their second album, Second Coming, to life, but anticipation for new music had plummeted by the time it was released in December 1994. While the lead single, Love Spreads, did reach number 2 in the charts, the band’s heavier blues-rock sound failed to gain the interest of critics and fans alike - both of whom were now enamoured with Britpop. The relationship between the band slowly broke down too, with Squire’s cocaine habit alienating him from his bandmates during recording sessions and Brown’s constant weed smoking becoming an annoyance, especially to Reni. Two weeks before their tour in support of Second Coming, Reni left the band and a replacement drummer was brought in. Touring was sparse following Mani’s departure, with the band cancelling a ‘secret’ comeback tour when the press revealed the dates. However, the true nail in the coffin was the band’s inability to perform at Glastonbury Festival 1995 following a mountain biking accident which saw Squire breaking his collarbone just weeks before the gig. A tour was finally organised for November/December 1995, with tickets selling out within a day. The 1995 comeback tour didn’t work out as well as they’d hoped and Squire left the band in April 1996. Attempting to stay afloat, former Simply Red guitarist Aziz Ibrahim was brought on board, but the band were far from what they once were. The Stone Roses just about kept their head above water until Reading Festival that year, with NME describing their performance of I Am The Resurrection as “more like the eternal crucifixion”. The Stone Roses officially disbanded in October 1996. Former members of the band went their separate ways throughout the 90s, forming a number of bands including The Seahorses and The Rub, while Mani joined Primal Scream as bassist. Whatever they did, the band consistently shot down any rumours of a reunion, with Squire insistent that he’d rather remove his liver with a teaspoon than participate in a revival tour. In 2011, rumours circulated that, more than 15 years after the disastrous Reading set, a new Stone Roses tour was on the horizon. By October, Brown confirmed that they’d be taking the world by storm, playing a string of four homecoming shows in Manchester as well as dates in Ireland and continental Europe. Following 2011, the Roses kept up their most consistent touring schedule since the late 80s. A string of festival dates in 2013 included sets at the Isle of Wight, Coachella, London’s Finsbury Park and Glasgow Green. This touring schedule culminated with the release of a documentary on the band, Made of Stone, helmed by This is England director Shane Meadows. The Stone Roses may have remained silent since their Glasgow show, but could you be one of the new voices to emerge? For a chance to record on some of London’s best vintage and modern equipment with veteran engineer George Apsion, contact Kore Studios today!